The drive from Port Augusta to Whyalla is almost gun barrel straight for much of the seventy kilometre journey. 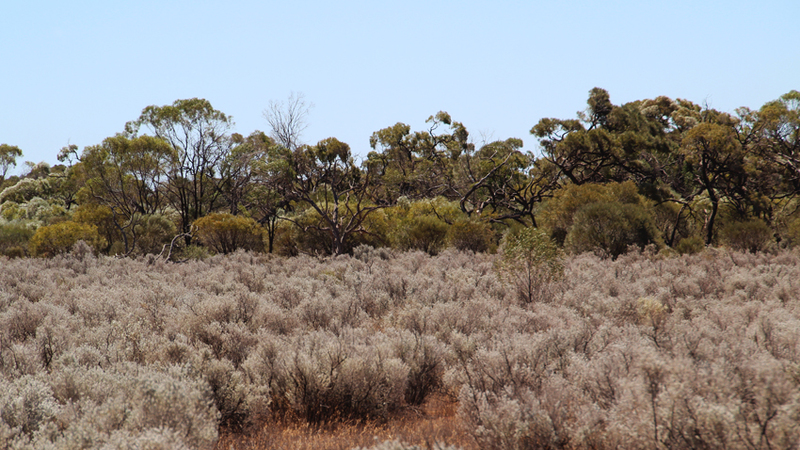 Low scrub and salt bush plains dominate the landscape. Small birds occasionally flit across the road and for the keen observer; kangaroos and emus can be spotted foraging in the bush. 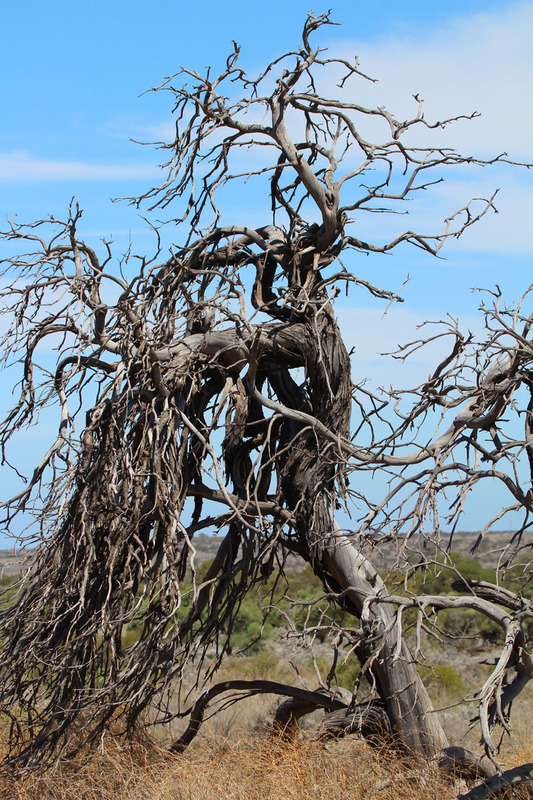 But first impressions can be misleading and more careful look at this unique environment reveals a plant ecosystem quite different from the eucalyptus dominated vegetation closer to Adelaide. The ground is hard pack red earth and salt bush, acacia and eremophilas form the lower layers beneath canopy of western mayall trees with an occasional eucalypt thrown in for good measure. The affect is a subtle interplay of greens and greys that typifies this harsh but beautiful countryside. 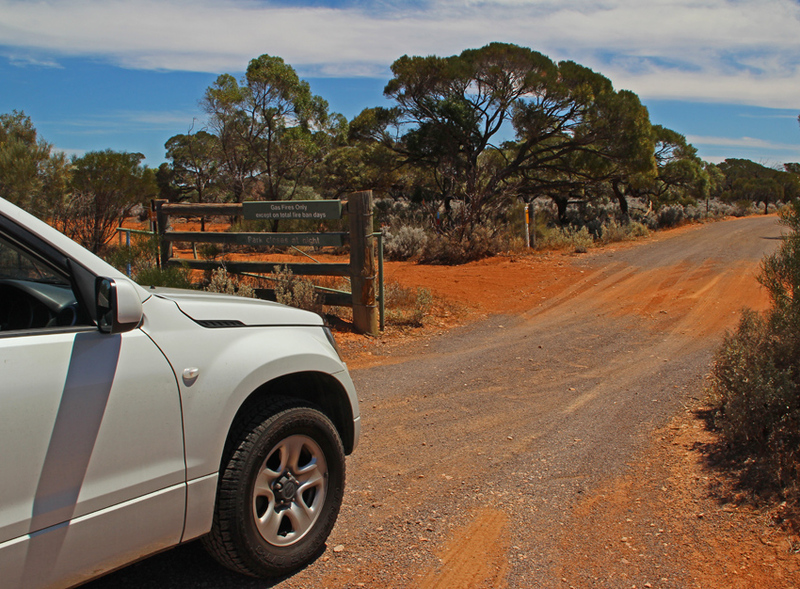 Around 50 kms from Port Augusta and just 10 kms from the outskirts of the steel town of Whyalla, the park is announced by a signpost and bush track that leads off to the right. 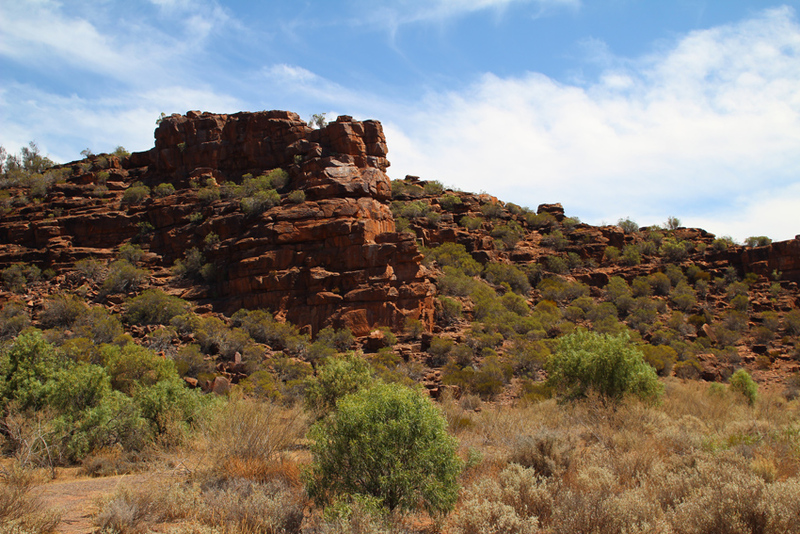 The trail is part of the Whyalla conservation park and the road leads to a rocky outcrop known as Wild Dog Rocks. A local Aboriginal story relates how a medicine man flung dingos, who had killed a child, off the north eastern edge of the rocks. This story and information about the plants in the area is presented as a series of signs along a short trail that circumnavigates the outcrop. 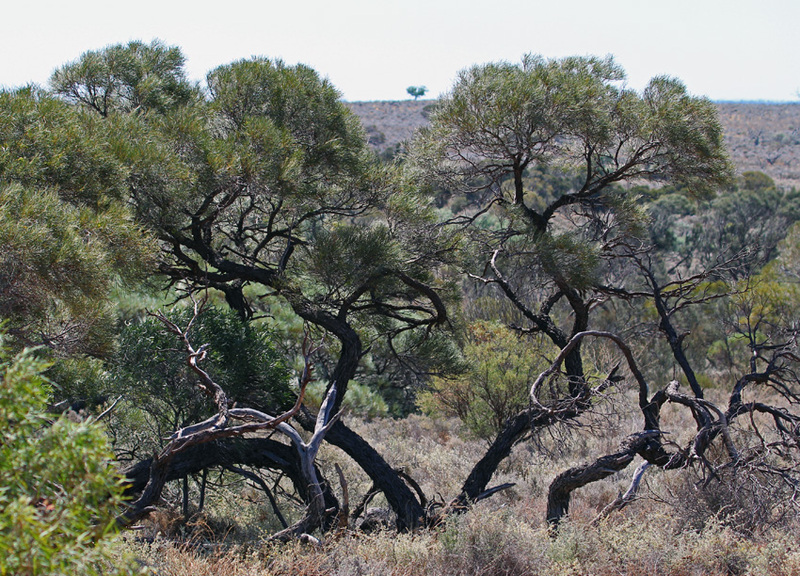 The mayall trees, lichens, various shrubs and grasses are all represented and provide the walker with a better understanding of this rugged ecosystem. Depending on the season a wide variety of wildlife frequents this arid zone. Parrots, honeyeaters, magpies and delicate little finches are just a few of the birds that live in the dense shrubs and grasses. And if one walks carefully, stops frequently to look and listens for a tell tale rustle there are reptiles to be found, ranging from tiny skinks, large monitors and even the occasional brown snake. Despite the complexity and diversity of this ecosystem it remains a harsh and unforgiving environment. There is little food and plants bloom infrequently due to the low rainfall. A visitor needs to be patient to locate the wildlife and as always the early morning and late afternoon are when the animals are more active and far more easily encountered. I set aside three hours to explore this park and stopped several times on the way to the rocky outcrop where I walked a couple of hundred metres into the bush and sat quietly for a few minutes. 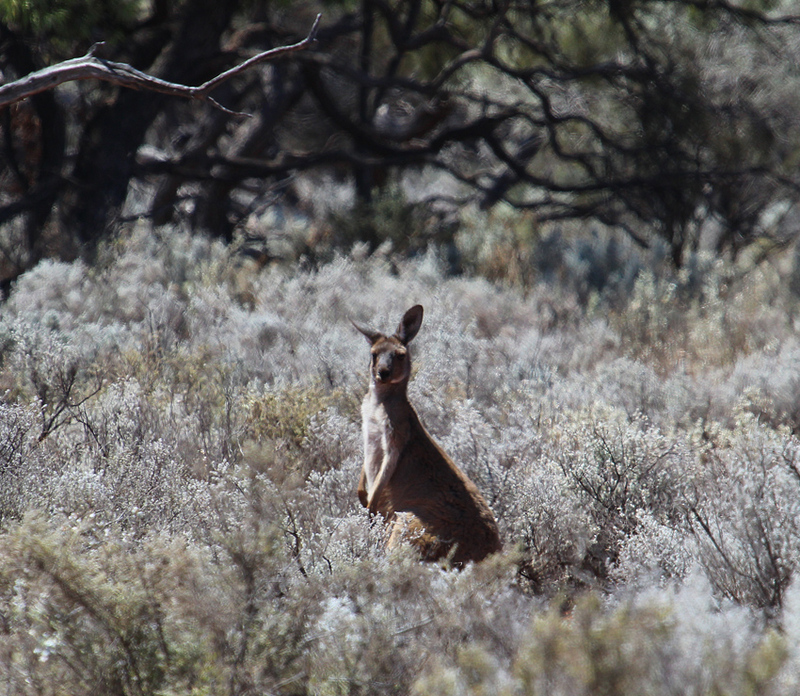 One the first occasion I flushed out a grey kangaroo that paused for a split second to look at me before bounding through the salt bush into the scrub. 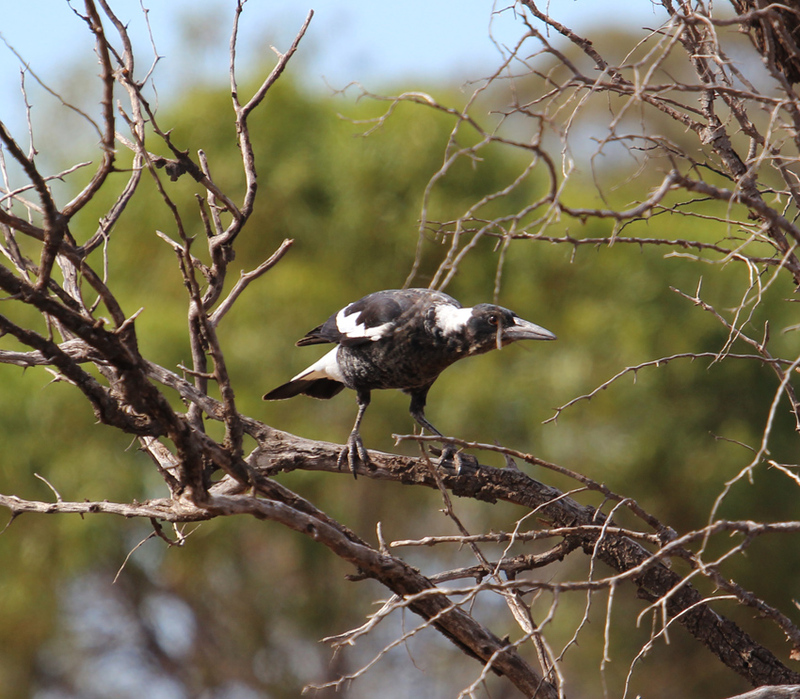 The second time I watched some butcher birds and a magpie squabbling loudly over territory. At Wild Dog Rocks I spent quite a long time watching small birds flitting between some flowering shrubs. Photographing them was challenging to say the least. I noticed that several birds seemed to return frequently to one particular bush allowing me to set up and capture a few long range images. 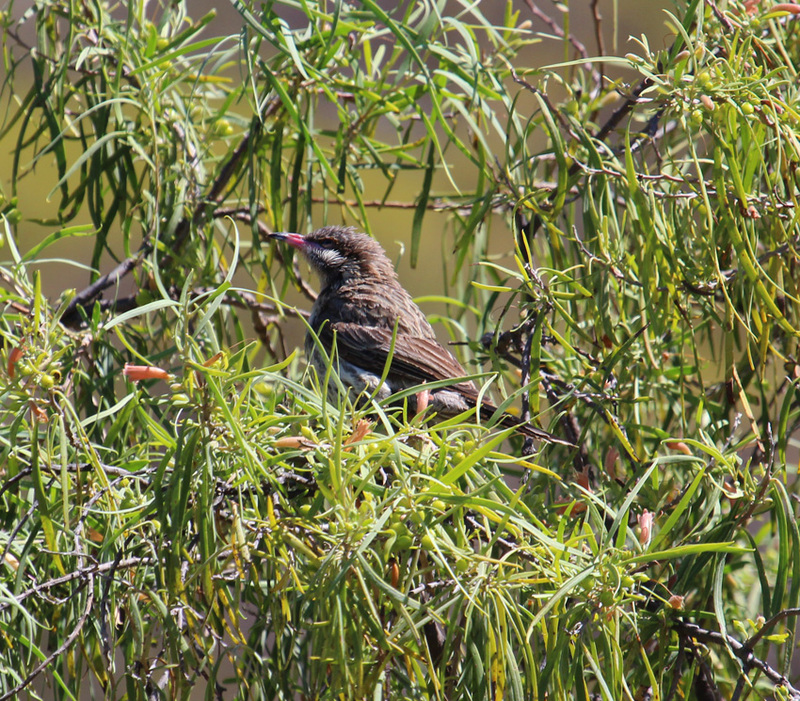 The birds turned out to be spiny cheeked honeyeaters a species I had not seen before. With evening approaching I made one last foray into the scrub at the foot of the rocks and sat amongst a stand of mayall trees where there was a clear view of a small clearing. After a few minutes I heard the unmistakable rustle of a larger animal moving across the leaf litter. 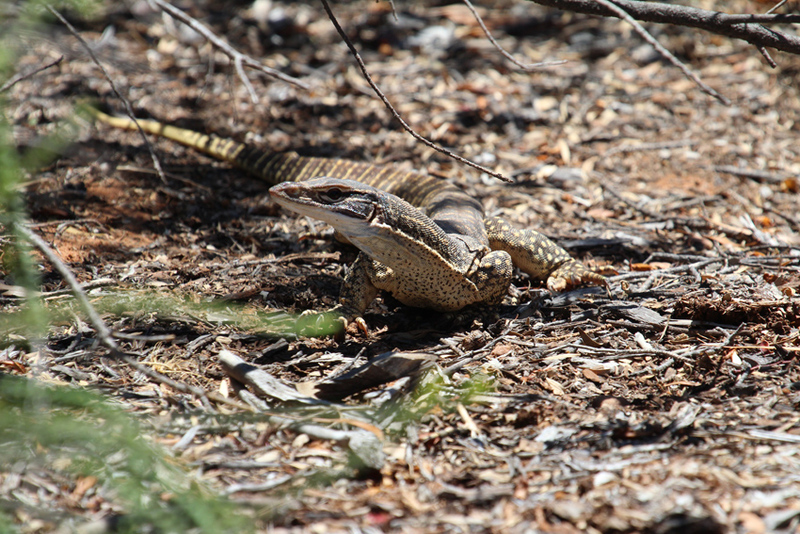 Suddenly a sand goanna appeared, the metre long monitor lizard was moving slowly with its long forked tongue frequently flicking out as it searched for prey. 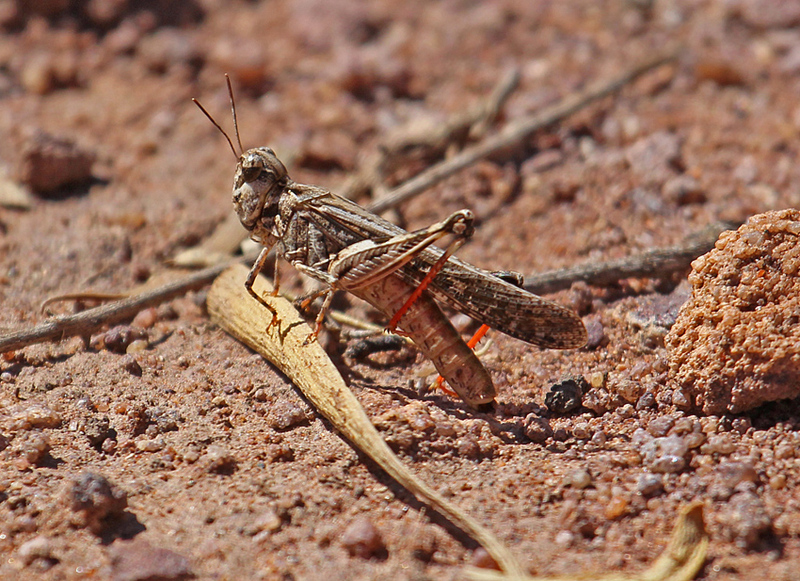 As the goanna approached dozens of locusts, that had been hidden amongst the undergrowth, took flight before they were added to the lizards eclectic menu. From the park to the city of Whyalla is a short drive. Here you can wash off the red dust and enjoy the pleasantries of hotels, regional shopping, restaurants, coastal activities and a fine golf course. Have a great start to the New Year and I hope you have the chance to explore this interesting region sometime soon.